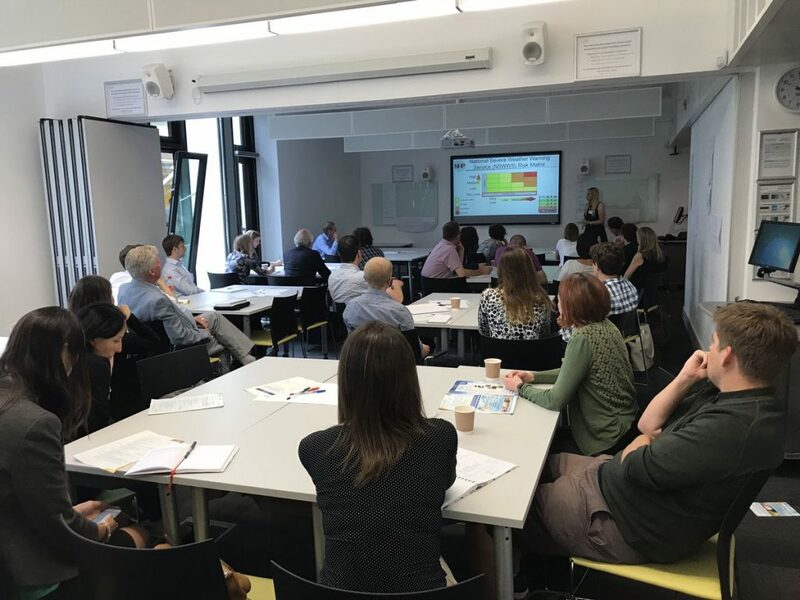 We were invited to run a workshop on ‘Observing Hazards and Impacts’ at the RMetS Annual Conference. 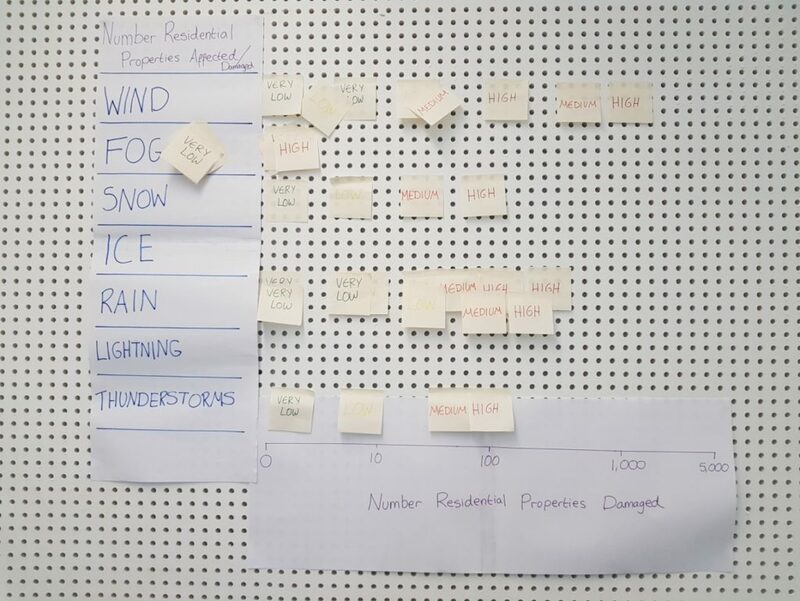 The workshop explored what makes good impact information, methods for collecting impact and hazard information and how it can be used along with how consistent impact categorisation could be beneficial for forecasting and verification. 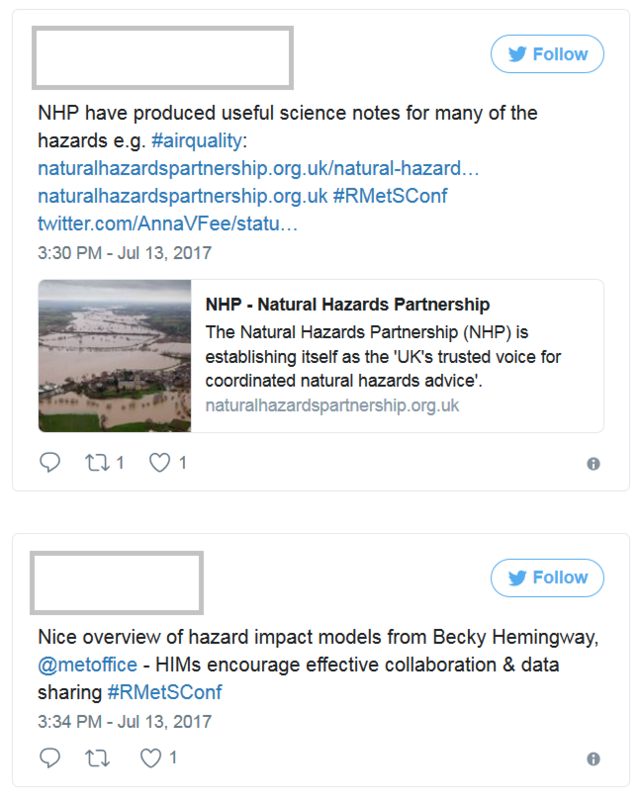 These topics are of interest to the NHP as collecting impact information in order to verify our Hazard Impact Models is critical to ensure they are trusted and useful. Overall the session went very well with people staying after the session ended to finish an exercise on impact categorisation! More detail on the talks and exercises can be found below. Rudy Arthur from Exeter University who talked about social sensing of floods. This is a joint project with the Flood Forecasting Centre looking at using Twitter to capture flood impact data for Flood Guidance Statement Verification. The NHP has interest in this as the methodology can be used for all natural hazards. Jake Brown from the Met Office presented on the Met Office Weather Observation Website (WOW). This has a great function which allows anyone to enter a weather impact report; Jake even did a live demo! This data has been used by the NHP in verification of the Vehicle OverTurning Model and is a great resource. Jo Robbins from the Met Office spoke about the Global Hazard Map: Community impact data to evaluate high-impact weather forecasts. This focused on the collection of global impact information and the challenges faced in creating a database for this. Again extremely interesting to the NHP as a similar UK has been discussed many times. The activities got everyone talking about impacts. The first, ‘the worst impact in the world’, asked ‘what makes a BAD hazard or impact observation?’ Here the idea was that it’s generally a lot easier to think of negatives then turn them into positives than just think of positives. It got participants discussing challenges faced when trying to use impact and hazard observations to verify models. Becky presenting the National Severe Weather Warning Risk Matrix at the workshop. Example output from Exerecise 2 on Impact Categorisation.